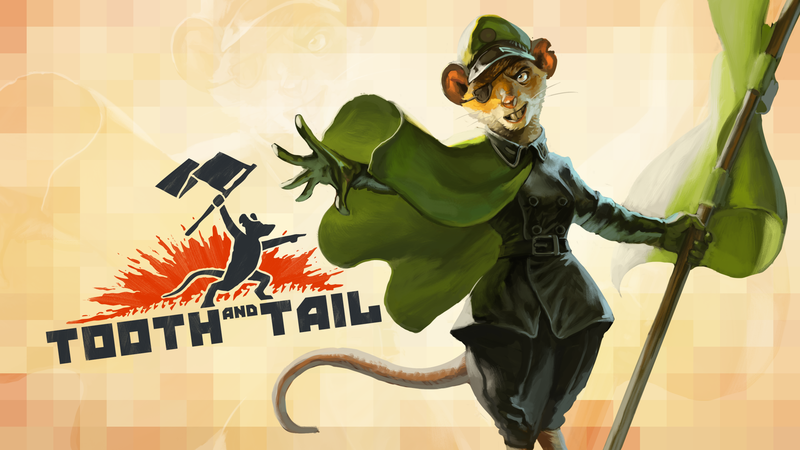 Tooth and Tail is a real time strategy game set in an eastern European anthropomorphic rodent revolution. The team at Pocketwatch Games previously stole our hearts with Monaco: What’s Yours is Mine, and they are back with their take on ‘Popcorn RTS’. 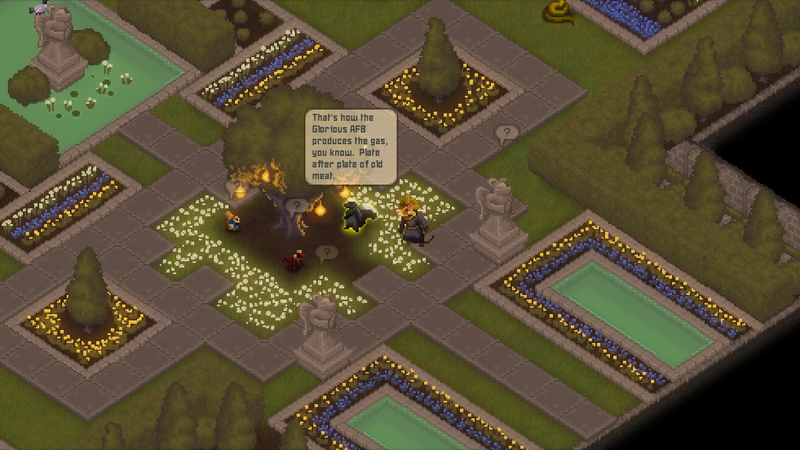 Pocketwatch has removed many of the barriers of entry for the genre such as a reliance on actions per minute or complicated unit management and has made an accessible strategy game. When I describe real time strategy to people, it usually comes with blank stares until I mention something like Starcraft, or Command and Conquer. These pillars established the genre and have paved the way for future titles, but nothing has drastically changed the way RTS is played. Collecting resources, building a base, creating an army, and battling your opponent; these are the foundations of any strategy game and probably haven’t changed much for a reason. So why change it? Learning how all the units work in an RTS is a basic principle, but also a huge mountain to conquer. One way Pocketwatch has changed this for Tooth and Tail to make it more accessible is having players draft their army into a deck before every match. There are four tiers of units with five units in each tier (20 total) and players choose any combination of six for the match. Drafting a deck is a genius method to teach players how to think about larger strategies before the match even starts, but also gives them a chance to learn the unit interactions on a smaller scale. The unit design is so smart and each of the recruits comes with their own thoughtful art, sound, and tactics. You want to zerg rush? Bring the engineering moles into the deck and hit the opponent fast and hard before they have time to react. You think you’re getting mole rushed? Counter with a low cost unit like drunken squirrels or comrade lizards to push back the tide. If my deck gets completely out drafted by an opponent, the next game I can swap out a owl for a wolf and completely change my strategy. The drafting before a match hasn’t been done in RTS before and is akin to many CCGs like Magic the Gathering, Hearthstone, or Netrunner. Once a deck has been selected it is time to put that plan into action. The rules of RTS still apply here: gather resources, build an army, command that army using your general. 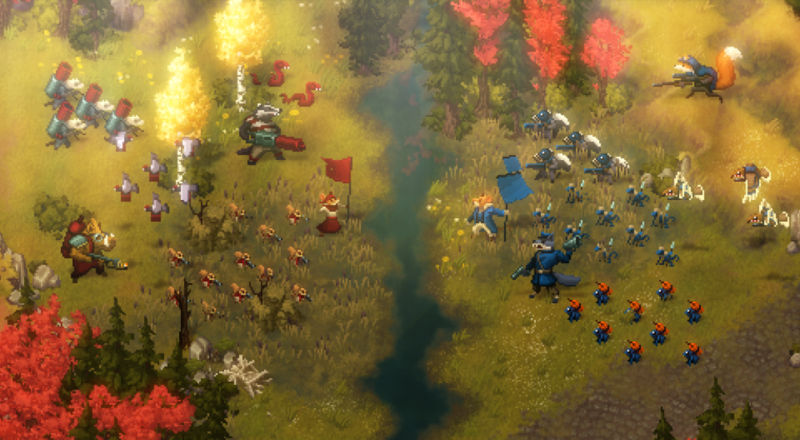 Tooth and Tail finds beauty in simplicity of mechanics to deliver complex design choices which don’t intimidate the player. You still need to position your units; gain advantages of high ground and sight. You can’t shoot what you can’t see. Throwing your units at your opponent with little remorse will be punished by superior tactics. Microing units isn’t as demanding as Terran Marines in Starcraft, but a player actively putting their healing pigeons in the back and their badger tanks in the front is going to get things done. What is awesome is all of this can be done on a controller! Pocketwatch figured out a way to make RTS work on a controller, and it all comes down to smart design choices. The whole game can be played with three buttons and a joystick, sitting back on the couch. But don’t worry, for those APM (actions per minute) analysts out there, you can still use a keyboard and mouse. There is only one resource in the game (food) and the only way to gain food is to build mills and make farms. While protecting your farms is important to ensure you have a steady resource supply, the more interesting aspect here is the mills. These structures not only provide food, but also determine the size of your territory and, in turn, where you can build. This concept of map awareness and map control is something most players don’t learn in an RTS until much later after tons of matches. Tooth and Tail manages to emphasize this and teach this lesson even before units have hit the battlefield. 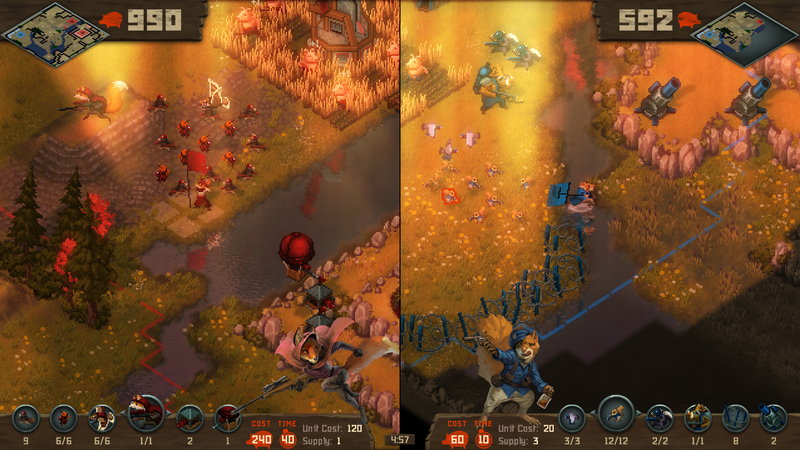 What Pocketwatch has done with Tooth and Tail is distill the genre down into something digestible. This way players don’t have to invest a ton of time into learning mechanics, and can spend more time establishing and executing strategy. 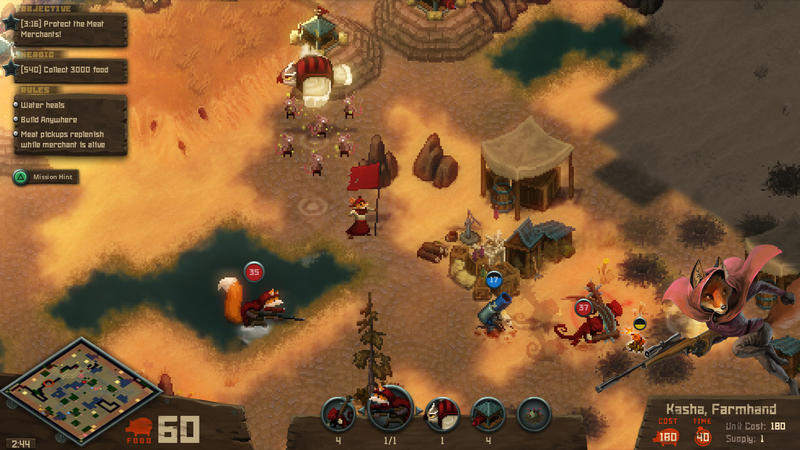 Tooth and Tail still requires both a micro and macro game but there is a focus on the nuances of what make this genre so enticing: recon, positioning, counters, execution. These are tropes within real time strategy games which come with practice, failure, and testing which means players have to invest a ton of time into learning. They have stripped away the usual barriers allowing players to spend more time learning. As each match only takes 5-10 minutes, players can play more matches, resulting in learning faster. 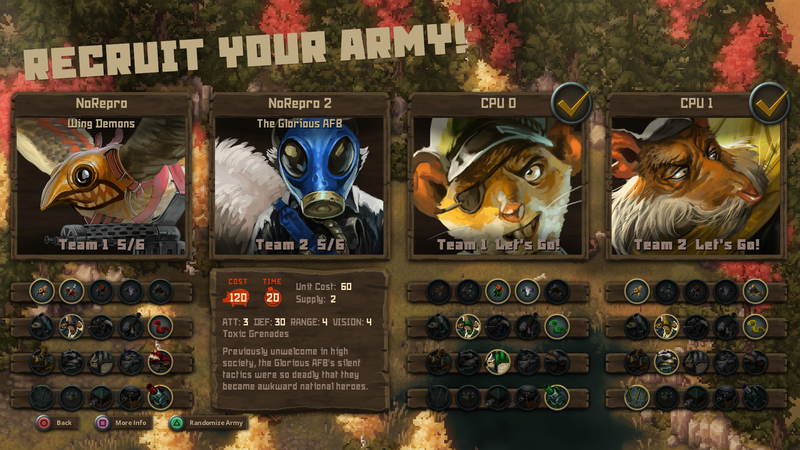 The co-op experience in Tooth and Tail is limited to comp stomp online and couch matches. You and a friend can start your own revolution together against the AI, which changes the game on a meta/strategy level and keeps the core game intact. There is still the randomized maps, deck drafting, and strategizing; you’re just doing it with a friend either across the globe or splitscreen. The splitscreen is actually really great and doesn’t cramp viewing real estate as much as one would think. The vertical split allows for a good view of the battlefield, and of course you can relay information with your partner to get a better idea of what is happening on the map. Communication is key in team battles, and having a partner beside you makes it that much easier. It’s unfair to expect a similar co-op experience to something like Monaco, as this is a completely different genre and experience. I’d be lying if I didn’t want something a bit more in terms of co-op but the game is so good regardless. I have to give it to the devs for coming up with a way to play an RTS with a friend on a couch using a controller. This simply hasn’t been done before. The co-op games lead to some interesting unit combinations; where else can I send a flamethrower boar into battle riding on a bed of snakes? Being able to plan, strategize, and play together on a couch with split screen is a really cool thing and something I have never experienced in this genre. 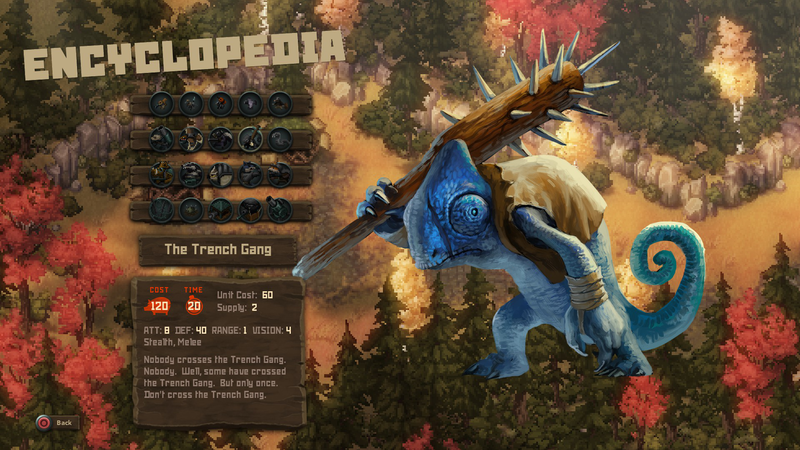 Maybe we can hope for a full co-op campaign in some future DLC because I would like to see some more stories told in the world of Tooth and Tail. 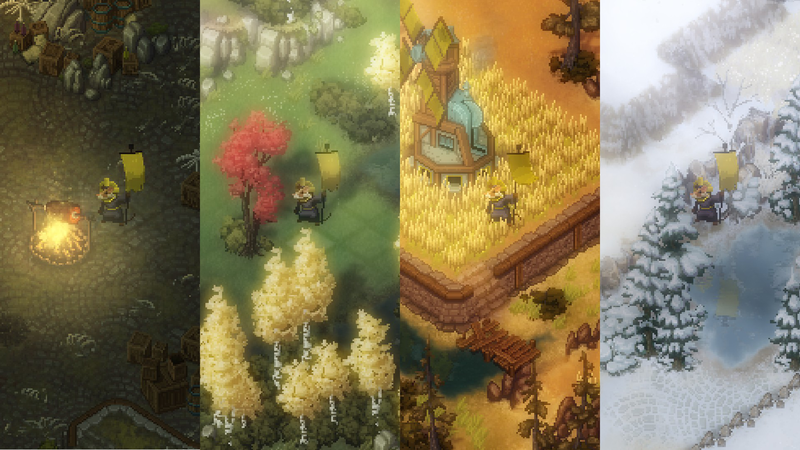 It is obvious Tooth and Tail has gone through a ton of playtesting, feedback, and iteration. The campaign is challenging and contains some great writing no one should miss. Solo games are where it shines, but the team battles and free-for-alls add a whole new layer of depth to the game. The sprite based world is beautiful and well realized with some of the best sound design this year. Short match times, deck drafting, and simple controls make Tooth and Tail easy to pick up and play, but also gives the opportunity for anyone to master. Pocketwatch Games have made their own revolution of real time strategy and simplified a steadfast genre for the better, and that is something I can rally behind. The Co-Op Experience: Join the revolution with a friend against the AI for some good old fashioned RTS comp stomp. Both online and splitscreen will support up to 3 players for co-op. Page created in 1.4794 seconds.